There is a certain way of looking at the world, accepted by both men and women. There are women who want to be independent, but they are so scared of not belonging to anyone. An unmarried woman feels like she is to be felt sorry for, but an unmarried man is to be envied. The woman wants to build her fate with her own hands, but there are lots of women who say, if they fail, “I’m only a woman”. Generally there aren’t many young men who make an ideal out of the “I’m getting married” idea, but there are still so many women who do, turning their marriage into a career. The woman who has to stay home with her children is often identified with the idea of weakness and she is considered a passive human being that needs protection, physical, but also moral, social and legal. Many people still have the tendency of despising an intelligent, cultivated, active woman because she doesn’t fit the feminine stereotype they know. Just like they tend to despise a sensitive and gentle man because he doesn’t fit their own idea of virility. In the contemporary society men who succeed are “virile”, which means ambitious, aggressive, without scruples, money chasing and glory chasing. At the same time modest, generous and sensitive men are considered effeminate. For many men, still, the woman who flatters his ego should be very beautiful, elegant, a good mother, a faithful wife, and also a passive, ignorant and capricious woman. You will hear very often the idea that femininity is the same with passivity, weakness, stupidity and immorality. Women got to accept their depreciation completely because of their education and of the society. The scorn towards women is still alive at both sexes. There are many women who do not accept them as women being convinced that being a man is the real gift of God. Menstruation, birth, menopause, they all have created the prejudice that a woman is someone who depends on nature and on her own body and that’s why she cannot reach the levels of intelligence, creativity and spirituality that a man can. In order to fit the “new image” of femininity, a lot of women waste their few spare time reading stupid magazines, chasing for the dress that will get out of fashion only a few months later, concerning too much about their hair and creating an existence filled with frivolous patterns. Thus they waste the time they could have used in knowing themselves and this stops them from thinking of the purpose of their lives. Nowadays, the women, who were underestimated century by century, make the big mistake of wishing to have man’s “superiority”, considering it as true freedom and personal achievement. The woman dreams to replace the man, to become an Amazon. But it is not solving the problem, but only reversing the roles. Though there are biological differences between men and women that make them behave differently in certain conditions, these differences are too small in comparison to what men and women have in common as humans. Setting the woman free of all prejudices is not an act that depends only on women. It depends on the entire world. The humanity’s outlook about woman is an expression of its conscience level. Most women do not know their possibilities, many have been left out in ignorance, and others have given up their studies because they had a baby and many others don’t even have a professional background. How is it possible for a woman to become independent and to have a creative activity when her soul and mind are not treated the right way, are not cultivated? The problem for a woman is to know how to resist the society’s conceptions about women and how to open up to her real mission, which is a spiritual one. There were times when the woman was more than a simple human being. She was the embodiment of Fecundity, Earth, Nature and Life. 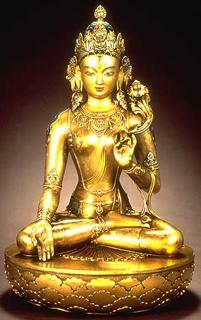 She was identified with the goddesses that governed the different aspects of life and thus she was considered sacred. The woman was worshiped in certain periods of time. She was a goddess or a priestess (the vestals, the hetaerae) or she was a muse. She was the embodiment of Beauty, Grace, Gentility and Kindness. She was the Mother, the Wife, the Lover, and the one who lead the man to God. 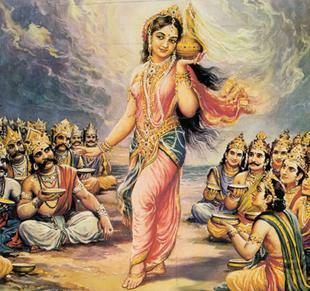 She embodied the Absolute and has got the mission of orienting the world to the Ultimate Supreme Reality. The spirit of the Universe comes to meet the man because of the Woman. The Woman’s Greatness is that of leading the world to God. She holds the world’s possibility to reach the Divine Light through life’s profound spiritualization and also to destroy it by amplifying its inferior tendencies. The Woman always comes up or falls because there is no other option for her. Waking up the feminine qualities is the way she gives herself to life. She cannot find fulfilment outside her being, except by accepting herself completely and consciously. And acceptance means not only becoming aware of her being a woman physiologically speaking, but also becoming conscious of her feminine qualities and of her role in this world. Her spiritual sense of life is that of turning people’s limited vision to the essence of the world through the wonderful manifestation of her Femininity. The woman has got the Principle of Creating the Universe in her. This principle makes everything move. Nowadays women are a lot more open to spirituality than men are, but they are not aware of their power and force that can change and wake up the entire world. They remain weak and passive, lost in small, unimportant things, accepting everything without even thinking of making a difference. And that’s because they do not know that they can do it some other way! It is time for the woman to learn to know herself better, to remind her of the light in her soul, to admit it and to see it in others, too. It is time for her to show the man the path to the light through her shining way of being. Both of them, together, enriched through love and union, can get higher to Immortality Land.